Emma Kay takes a look at the Nest Athena A70 backpack, that holds a DSLR and up to 4 extra lenses. The Nest Athena A70 is a backpack that holds a DSLR with lens attached and up to 4 additional lenses in the bottom compartment, and space for your personal belongings and other accessories in the top section. The bag is available in brown and black, and retails for £84.99. We took a look at the black version. More information on the Athena range is available on the Nest website. The Nest Athena A70 has lots of pockets and compartments for all your gear and personal belongings. On the front, there is a zipping compartment with internal pockets and a velcro fastened mesh compartment and a vertically zipped slim pocket above it. The top section of the main compartment is double zipped, and reveals quite a large space for your personal belongings, along with elasticated mesh pockets on the back wall. 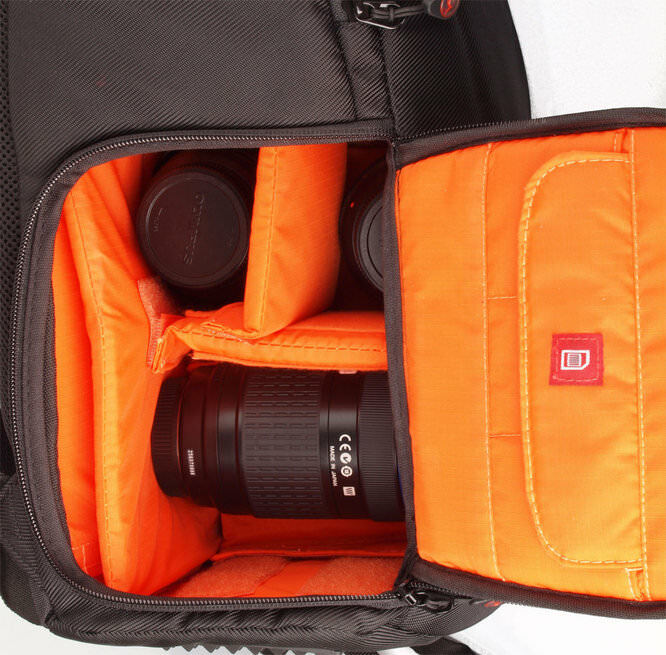 Below this is the DSLR compartment, which is accessed by either side of the bag. 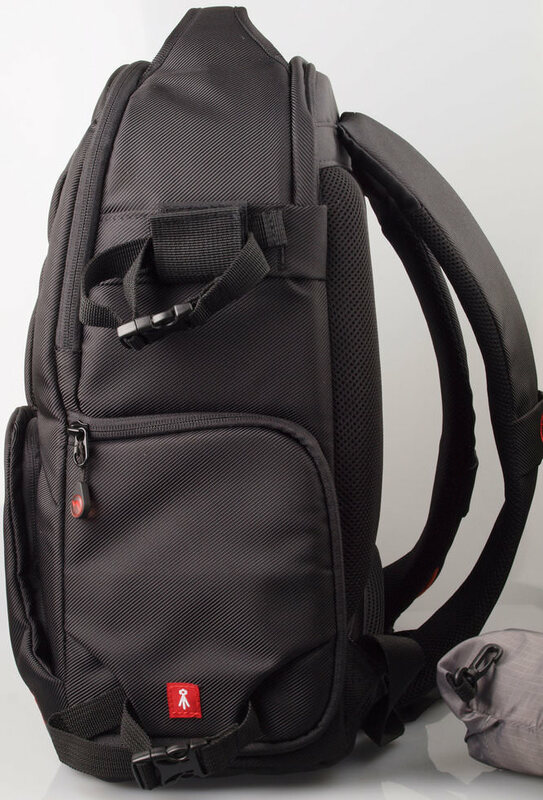 The left access flap features 3 memory card pockets on the inside, and the right access flap features straps enabling you to attach a tripod to the bag. 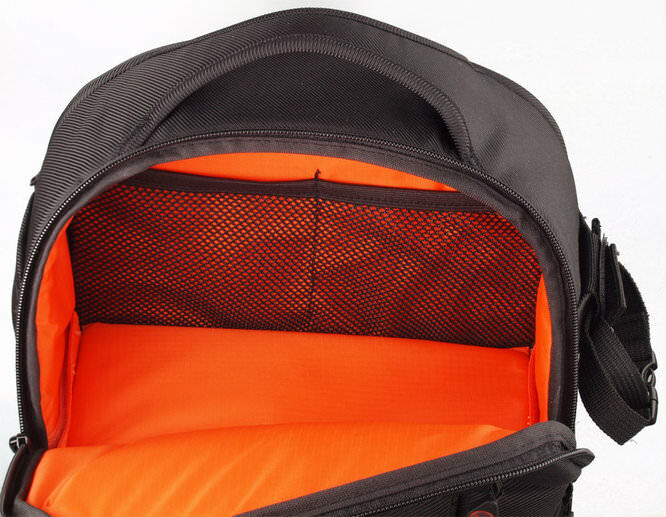 Inside the main compartment there are plenty of movable velcro dividers so you can customise the bag to fit your kit. On the back of the bag there is a slim padded compartment that'll fit a 14 inch notebook, laptop or tablet. 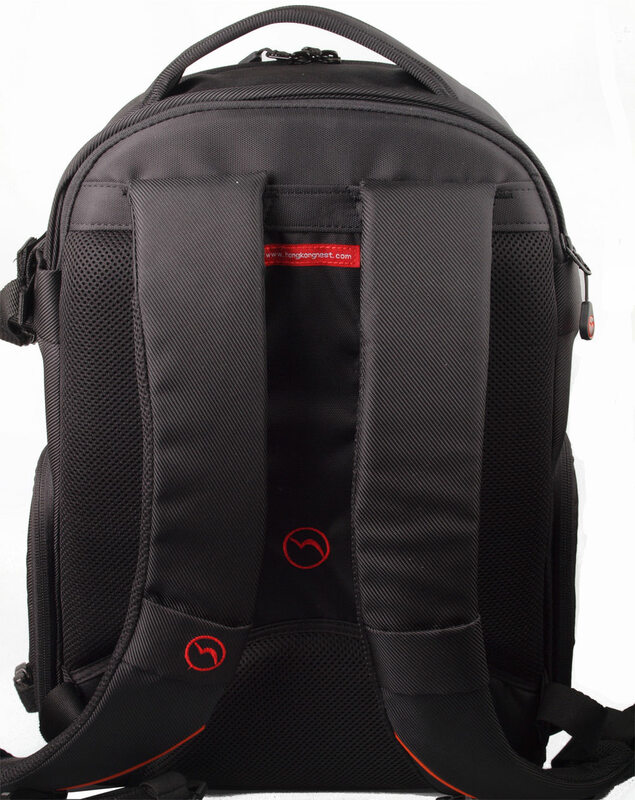 The padded straps on the backpack are fully adjustable and have a chest clip, for particularly heavy loads. They also feature robust loops, allowing you to clip or attach things to them. The bag is designed so you can access the camera compartment by swinging it around to your front on one shoulder, and it's really easy to access your equipment by doing this. The flap opens towards you, avoiding any issues with it getting in the way and blocking your view whilst extracting your gear. The tripod clips are detachable and can be used on either side of the bag. This is handy as when a tripod is attached, you can't access one of the side flaps to the main compartment. The bag feels comfortable to wear, and the straps are easily adjusted to suit your build. It has been well designed, with smooth zips and easy access to all compartments. Everything is well padded, and having the heavy camera compartment at the bottom makes the bag well balanced. The Athena A70 retails for £84.99, which isn't too bad a price for a bag of this size considering what you're getting for the money. The A70 comes with an all weather cover in case you're stuck in adverse conditions, it has lots of easily accessible pockets and it feels well built. It is also very customisable, with detachable tripod loops and lots of adjustable padded splitters so your equipment fits perfectly. Other bags of a similar size include the Vanguard UP-Rise II 45, which can hold a DSLR with attached lens and up to 5 extra lenses, and is expandable to accommodate different gear needs. It retails for around £89. Another option is the Kata 3N1 22DL, which can be worn three different ways and holds the same amount of equipment, for around £83. 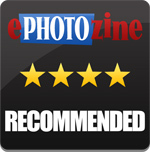 The Athena A70 is a great all rounder backpack, and it doesn't really look like a photography bag, which is a bonus. It's sleek design means it will look at home in the city, and the robust build and waterproof cover make it equally as apt for use in the great outdoors. 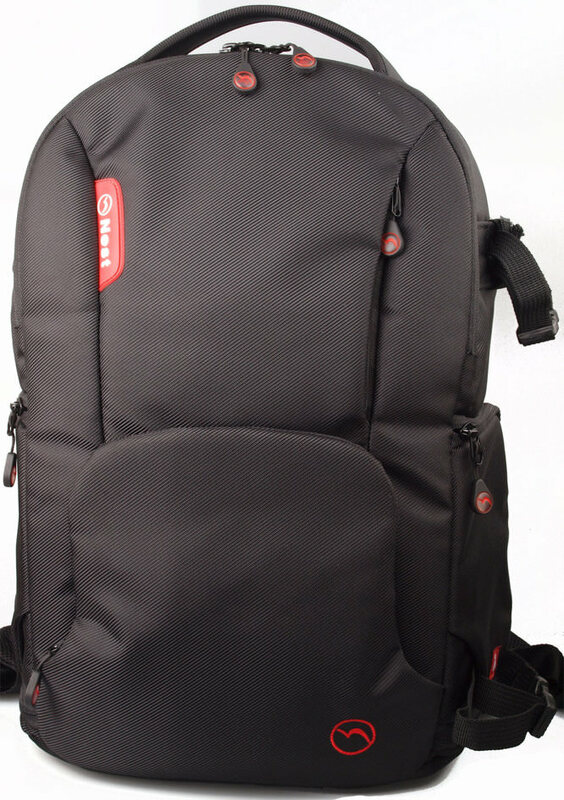 The quality and versatility of the bag is on a par with the big names, so if you're looking for a large photography backpack that's really customisable and has lots of pockets and cubby holes for all your equipment and personal effects, then this could be the bag for you. 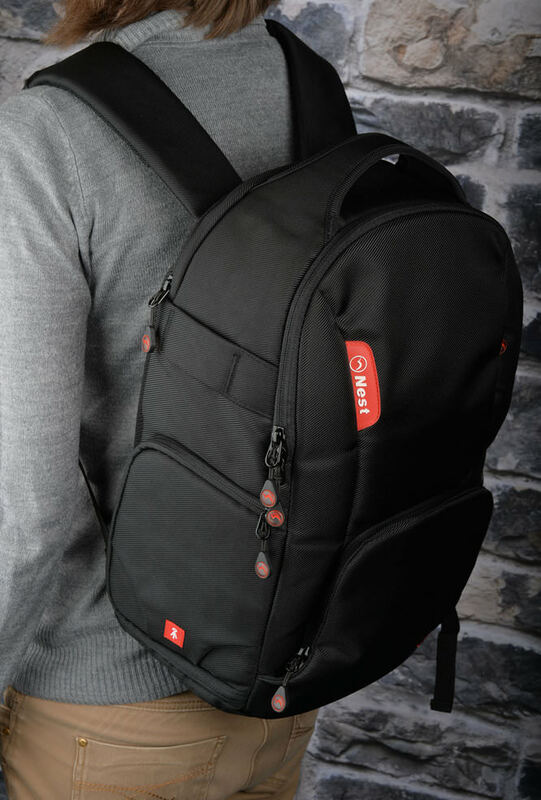 The Nest Athena A70 is a versatile, well equipped and well designed backpack.